Learn and develop best practices to increase bottom-line savings. 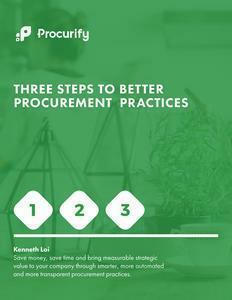 In this paper we identify three key procurement practices you can start implementing or improving on today. The knowledge you'll learn will take you from procurement newbie to procurement pro. The Three Steps To Better Procurement Practices whitepaper will cover Budget Management, maintaining efficient Approval Times, finding the right E-Procurement Systems, and managing Audit Trails. Make Better Decisions - Save Time And Money! Establish stronger policies across spending brackets and team roles. Enable smarter e-procurement by automating time-consuming tasks. Gain better visibility. According to the Hackett Group, an average of 14.4% of all indirect spending is non-compliant. Establishing strong budget management processes will positively affect your bottom line. Key issues included involve understanding where and why your money is being spent. If you're still using paper, email, and excel spreadsheets to manage purchase orders - then you're doing it wrong. Learn why more and more businesses are adopting an e-procurement management solution. Learn how to identify the sources and causes of your business' shrinkage. Proper supply chain management will help you identify inventory counting errors, and lost or damaged products between manufacturing and retail. Utilizing fraud prevention policies will place checks and balances throughout your purchasing process. Consider how many approvers who must sign off on purchase requests, and their dollar amounts or quantity limits. Copyright © 2017 Procurify. All rights reserved. By accepting to receive communications from Procurify, you will be contacted via email with educational material such as whitepapers, blog posts, and webinars. You may also be contacted for promotional reasons from Procurify. You can unsubscribe at any time easily by clicking unsubscribe in an email received from Procurify.